What do you think of Booster's beard? Would you like to see it stick around for future adventures? Or do you want your clean-shaven baby-faced Booster back? 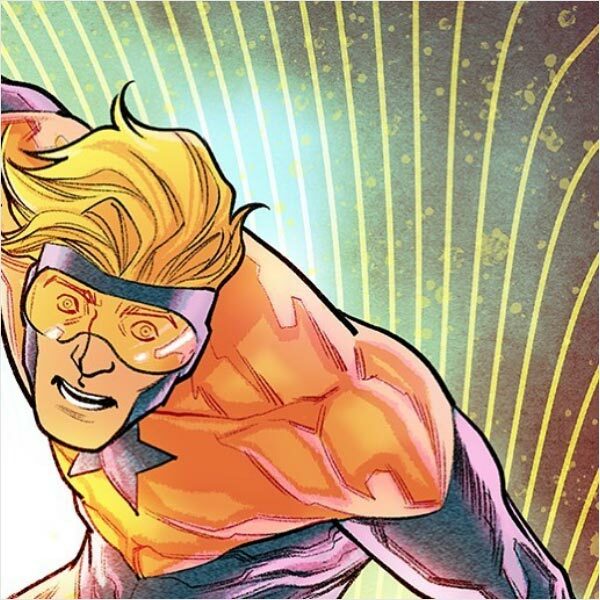 This week's poll question: Should Booster Gold keep his beard from BATMAN 46? Please visit the Boosterrific Polls page to view results for this week's poll. Shave it, but have it come back from time to time. Hopefully he beard goes away, and this mis-managed version of Booster Gold leaves too. I want the REAL Booster back. I agree with all previous comments. This characterization is terrible and needs to go. Booster seems like a clean shaven guy to me, BUT beards are in and BG wants to capitalize on that. Also I have a beard and if he has one that would make it easier for me to pull off Cosplaying BG. I am okay with the beard popping up occassionally. As a occassionally bearded Booster Gold cosplay hopeful, it would make it a canon variant for me. I voted for leave it. I think that it makes him look like Rip Hunter. But we couldn't vote again on the same computer, and Mom likes him without. Likes the old Booster attitude to. This new attitude makes him sound like Starman from the JSA comics.. Your mother sounds like a very smart person, Bob, so I've added her vote to the database manually. Every vote counts! If Booster Gold stole three super powers and then stole five more, how many super powers has he taken in all? 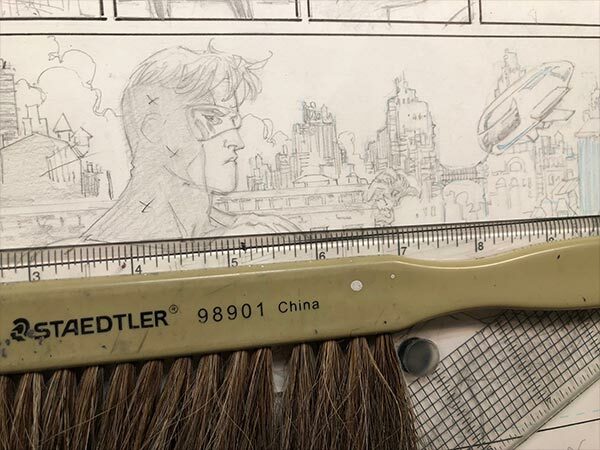 That's Batman artist Tony Daniel tweeting his take on Booster Gold and Skeets in pencils from what is presumably Batman #45, due to hit shelves on April 18. I can't wait! Last Monday, I guessed that Francis Manapul was teasing his cover for the upcoming Action Comics issues featuring Booster Gold. This weekend, he proved me right. Said Manapul on Instagram: "I'm taking over the variant cover art duties for #ActionComics and I couldn't be more excited! 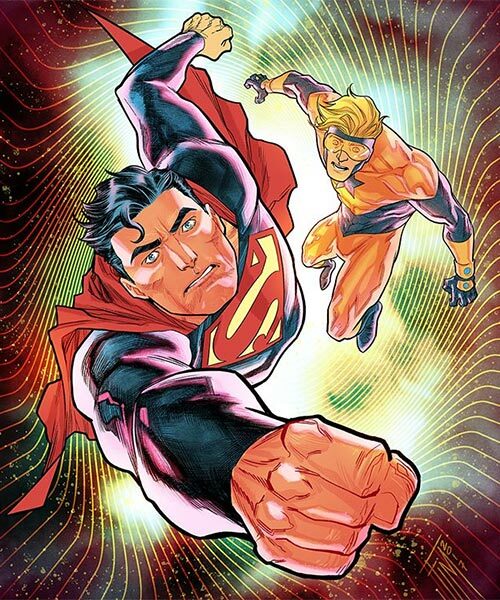 Here's the first cover of my run, #Superman along with time travelling #BoosterGold"
Presumably, that's the alternate cover for Action Comics #993, due December 13. 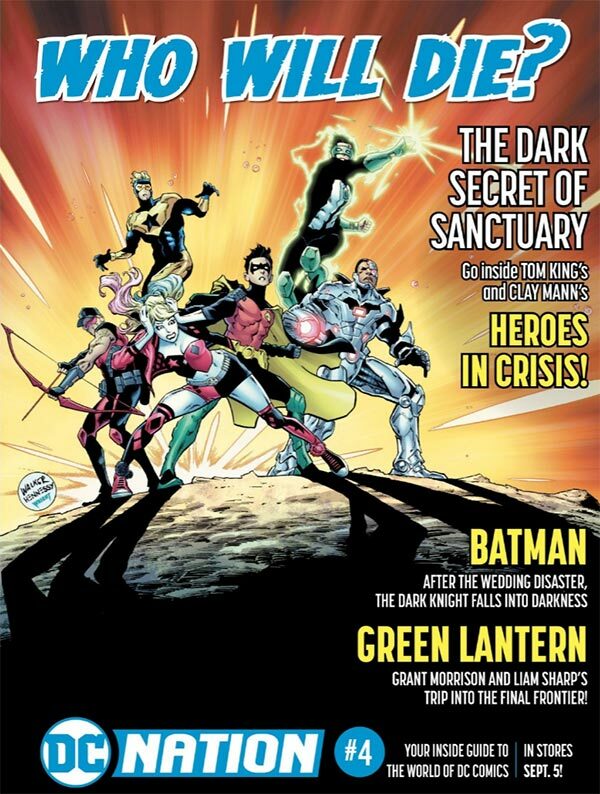 DC has already released an image by Dan Jurgens presumed to be the standard cover. Neil Edwards and Jay Leistin were originally announced as the variant cover artists; I assume at this point that was an error. If Booster Gold gave five news interviews and then gave seven more, how many interviews has he given in all? Manapul has been working for DC Comics for a decade, and in that time he's never drawn Booster Gold for publication. Is this about to change? The instagram post is tagged "#actioncomics", which leads to the implication that this will art is part of a cover for an as-yet unreleased issue. Although DC hasn't announced that Manapul will be providing any covers for the title after next week's Action Comics #992, we already know that solicitations for issues of the "Booster Shot" story running through Action Comics in December and January misidentified interior artists. (Brett Booth will not be drawing interiors on issue #993 or #994.) It seems increasingly likely they were wrong about at least one cover artist as well. We'll be keeping an eye out! Thanks for the help, Ithildyn. I believe it will be a varient cover. Francis has been doing alot of those as of late. But I would love to see him do a booster Gold book. One of my top favorite artists. If Booster Gold stole four super powers and then stole seven more, how many super powers has he taken in all? If Booster Gold travleled forward in time three years and then traveled back three years, how many years forward is he now?